Running in the 600m event, Jackson would stride his way to a time of 1:24.08. The time is a collegiate best for Jackson and was a mere 2-plus seconds off the championship pace. Both runners finishing in front of Jackson’s third place mark were WHAC student-athletes. The time suggests Jackson is undoubtedly in the running for a 600m conference championship in two weeks time. 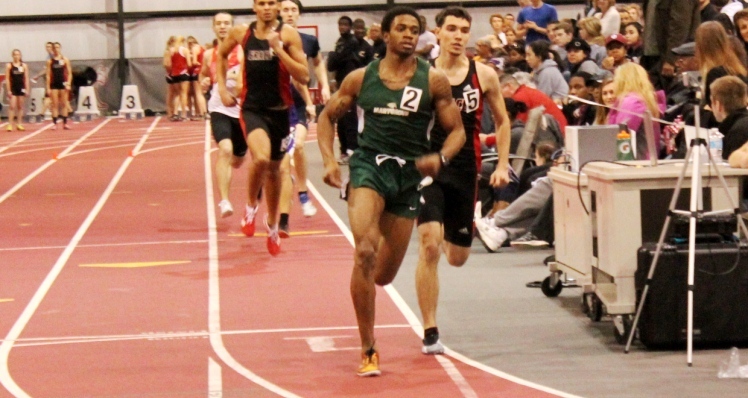 In the 60m, freshman Franz Beauregard (Detroit, Mich./Macomb CC) dashed his way to an 8.07. Beauregard would enter the 200m as well and finish with a 27.82. Also entering the 200m was redshirt freshman Jalen Wilson (Detroit, Mich./CMA). Wilson would finish strongly with a time of 26.06. In the one mile run, sophomore Robert Crockett (Detroit, Mich./King) was just shy of his previous PR of 4:49 after finishing with a stellar time of 4:53. Sophomore Akil Prowell (Detroit, Mich./Crockett) and freshman Gaoussou Cisse (Southfield, Mich./Lathrup) finished the mile rum with times of 5:15 and 5:28 respectively. Prowell would also enter the 5000m and cross the line at18:01. Next week, the Mustangs will get one final tune-up before the 2013 WHAC Championships when they visit Grand Valley State University for the annual Big Meet on February 8.